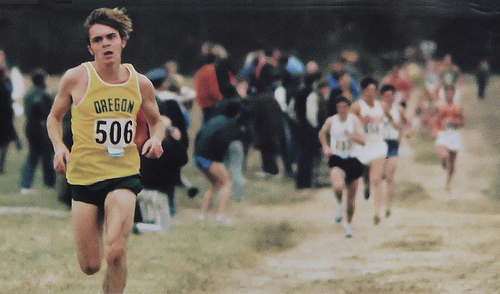 Wouldn’t it be great to run like this guy… needless to say, no running goals here! Now that I’ve closed the book on 2013 and managed to squeak by and hit my 2013 goals, moving forward to 2014 is important. If you’d like to see my final 2013 goals page, check it out! For me, goal setting is an enabler, of course in the most positive way possible. Goal setting helps feed my addiction for investment analysis and investing in general. For 2014, I will continue to set passive income goals for my dividend and peer to peer lending income. Additionally, I am adding a blog performance goal to help me track how the blog is doing. While certainly important, it isn’t near as important as the passive income goals. In 2013, I ended the year with $2,643.48 of passive income between my peer to peer lending and dividend income. When setting my goals for 2014 I had to take a few things into consideration while making sure I pushed myself past what was already obtainable with my current investments. This coming year will be an interesting year investment-wise as my fiancé and I bought a house at the end of 2013 and will be getting married this year. As I’m sure many of you can imagine, this alters the capital demands of my life and affects many things, including the capital I can put towards my investments, and not just those tracked on the blog. My current projections and capital commitments defer a lot of my additional investments to the back half of the year, cutting down on some of the income growth that would have been gained by investing from the beginning of the year. All that being said, I am going to really challenge myself with aggressive goals, knowing that if I don’t hit them, I will have still vastly improved my passive income. Starting off first, let’s tackle my peer to peer lending accounts. Lending Club – Net Interest of $1,950: In 2013, my taxable and Roth IRA Lending Club accounts earned a total of $1,503.05 of net interest, exceeding my 2013 goal of $1,480 by $23.05. Undeniably successful, I have high hopes for 2014 even given the limited capital I can commit. So, in reaching for the stars, my goal for 2014 will be an increase of $470 from 2013’s goal to $1,950 of net interest across both of my Lending Club accounts. Prosper Marketplace – Net Interest of $400: I had a fantastic start to my investment with Prosper after opening the account in May of 2013 earning $134.49 of net interest. I know that I cannot expect to continue at such a high level as late notes and defaults will certainly come down the pike. However, I am not satisfied staying put, and put together a significant increase for my 2014 goal. Representing an increase of $280 and 200.3%, my goal for 2014 will be to earn $400 of net interest from my Prosper account. Dividends – Receive $1,650 of Total Dividends: After a great year in 2013, this year my goal will be to receive $1,650 of dividends in 2014. 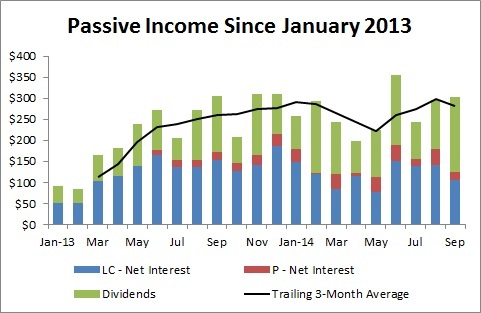 Unlike my peer to peer lending accounts, where additional contributions can turn into additional net interest within a couple of months, dividends are a different story. With dividends, you must rely on the timing of quarterly ex-dividends dates and can sometimes go 4-5 months without receiving a dividend from a position. This puts me in the precarious position of stretching my income goal by increasing it by $650 over last year’s goal and requiring additional contributions in a year where things are quite in flux. In addition to the monthly totals above, the below chart reflects my growing stream of passive income since the beginning of 2013, when I started tracking passive income on my blog. While not a huge milestone, I passed my first year of blogging back on the fourth of February. I say not huge because I did take a nice four-month hiatus last summer. Since starting back up in the middle of October, I’ve seen a nice rebound in traffic and writing motivation (free time helps with that!). I know that my time will get even more limited towards the back half of the year once married and back in school (pursuing my MBA). To help encourage me to focus on regularity and consistency, posting a blog goal should foster that motivation. Public goals foster accountability and accountability fosters action. Traffic Goal: In my first almost 11 full months of blogging, going through December, including my extended summer break, I had 7,614 unique visitors come 10,693 times and look through 19,931 pages. I wrote a total of 71 posts and covered everything from whether to DRIP or Not to DRIP to refinancing my rental to the multitude of changes behind the scenes at Lending Club. While I certainly enjoyed some success my first year, I really killed the momentum generated in my first couple months of blogging when I wasn’t posting during the summer. This was also compounded when I had some hosting issues resulting in almost no visitors during July. There is a lot going on in 2014 and I couldn’t think of a better way to write my own reality. Join me on my journey to find my own slice of financial freedom. You can follow me on Twitter, Facebook, or by subscribing via email at the top of my sidebar. My RSS feed is also available by clicking the feed link at the top of my site. I really like your goal set up. It looks like you’ve thought out your passive income options, and have a path to achieve your goal. Good luck! I’m interested to see if you get 10%+ returns with Lending Club. Thanks cashrebel! I am glad you stopped by! I’d love to see some details on how your increased investment in Prosper is doing! Those are indeed some really nice goals you have set up there. However, have you discussed elsewhere on this site your long-term goals? For example, I expect that my total dividend income will exceed my expenses in about 5 years. No, I have not expressed any long-term goals in strict dollars yet, but will at some point. I’ll be sure to link it here once I write that post. Additionally, congrats on the size of your passive income stream! That is a tremendous amount of production and a heck of an accomplishment. Good luck to you in achieving your goals! It sounds like you’ve had a rough start to your 20s (from your “About” page) but your optimism is evident. With your attitude and aptitude for generating some good dividend and option income, I think you’ll definitely achieve these goals for 2013. Do you have longer term goals, such a financial independence by a certain age? Thanks for stopping by Spencer! I am pretty set for 2013 based on my current progress and will reconsider my goals for 2013 at the six month mark. I don’t have a set time line or age for financial independence, but the goal is there nevertheless. If I had to put a number on it, it would be 45. I am in no rush, but certainly don’t want to linger in the working world. As life has plenty of challenges and changes ahead, I am maintain flexibility and optimism as I “get back on the horse” so to speak. I like the way you listed the total visitors and page views. Your numbers would probably be way up there if you did nit have the break in the summer. Keep the writings coming and your numbers will increase. I will be looking forward to reading all of it. Thanks for the support Robert, I appreciate that! I just reread the page and I like the lending club numbers. Seems like you are doing quote well with it. Do you invest the interest in stocks or are you relending the proceeds? I am asking because I was wondering if the interest is on the original amount or if the money is being parlayed and each loan is using all the interstate and principle from the last loan? Currently I am reinvesting both the interest and principal paid back to me. When I need to the cash as a source of passive income, I will likely draw a portion of the interest and reinvest the rest to continue growing the passive income stream to match inflation. At this point, unless I add cash, the new notes are simply the reinvested dollars (almost like reinvesting dividends selectively into new shares). This is essentially my “DRIP” for P2P lending. Hope that answers the question. Feel free to let me know if you have any other questions about P2P lending. I enjoy your blog. Well organized and easy to read and follow. Congratulations on achieving your goals for 2014! Curious about the blog. Could you share what your costs are/were regarding the evolution of your blog and what you actually make ($) in terms of income from carrying ads, etc. Are you using WordPress.com or WordPress.org? Any other suggestions or comments for would be bloggers would be helpful. Thanks! David, I’m glad you like the blog. I know I enjoy writing it and sharing my thoughts, experiences, and successes. As for the ‘under the hood’ numbers on the blog, there isn’t much to them. I have a wordpress.org site that is hosted on a shared-hosting service. I don’t make a ton of money on advertising on the site, but it is plenty to cover my expenses which is the primary purpose of them. I try to keep the advertising impact minimal on the readers and avoid in-post ads and ‘above-the-fold’ ads which are generally the big money makers. My biggest advice for a would-be blogger is to just get in there and start writing. The logistics of making money and fine-tuning a site is very much secondary to the content. People don’t come back to check out your ads, they come back to read what you’ve written. Best of luck as you determine what you want to write about and for reading my site.